As you may know, yesterday was a pretty miserable day at the River Oaks Country Club. 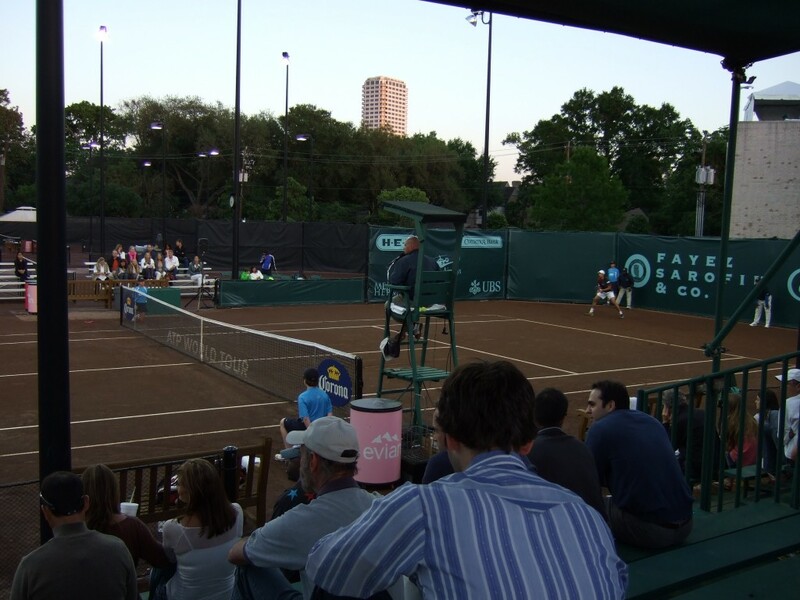 The Men’s Clay Court Championship saw almost its entire slate of matches wiped out by rain (the forecast had called for precipitation, but it didn’t come close to predicting the destructive amount Houston got). Tournament officials were hopeful until the very end to get some matches in, but the annoying light drizzle that just wouldn’t go away (or unexpectedly turned into a full-on shower) ruined everything. 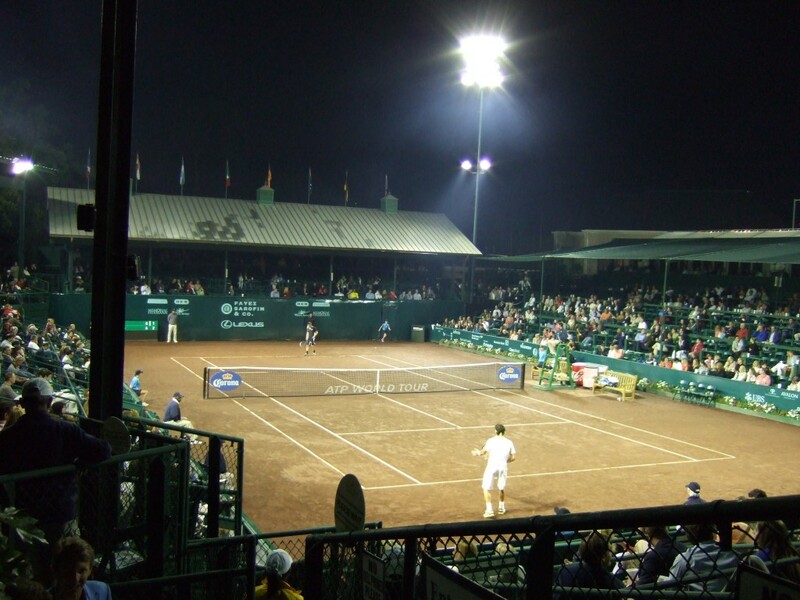 Tiny – but phenomenal – Court 3 will see big names like Fernando Verdasco and John Isner. Monfils-Almagro, which was yesterday’s featured night match along with Haas-Berankis, is now a day session match. Jack Sock could end up playing three matches today: he’s slated for a singles duel against Sam Querrey and a doubles match (with partner Steve Johnson) against the number 2 seed in the doubles tournament, the Lipsky/González team. 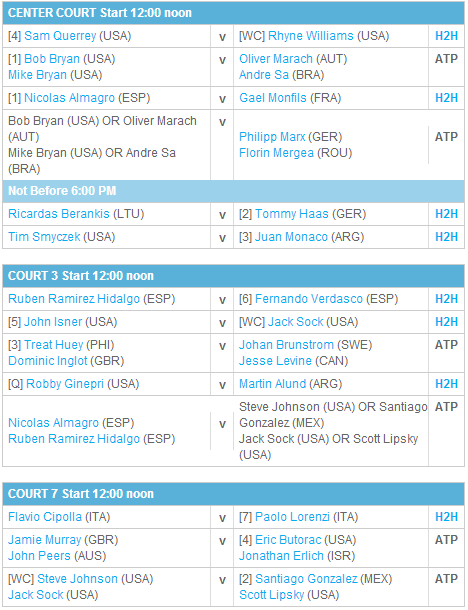 Should Sock and Johnson win that match, they would face Almagro and Ramírez-Hidalgo at the end of the day. It’s going to be a mad, entertaining-as-heck day, and the weather seems like it will cooperate. Since there will be so much action going on all over the grounds, I don’t see myself sitting in the media room except for pressers. Hence, here’s my plan: a mobile liveblog! I’ll be providing updates throughout the day from my tablet. If you see any typos or if a sentence doesn’t make any sense, do remember that I’ll be typing from a little seven inch screen. I will do my best, though, to avoid these unforced errors! (Note from much later: I couldn’t help myself and edit some of the stuff I wrote. I also bolded all the time stamps. My dear wife helped me catch an enormous amount of typos during the day, which is most appreciated. And since I couldn’t access my camera photos during the day, they’re all now in the places where I wanted to place them). Do join me as I attempt to chronicle all the action from today’s crazy schedule. I’ll start each update with a time stamp (local time). 12:03 pm: I’m courtside on Stadium Court, and Wayne Bryan just informed the crowd that Sam Querrey has pulled out of his match against Rhyme Williams. Seems like the Davis Cup injury was too much. Sam apparently warmed up to see if he could give it a go, but couldn’t make it work. As a consequence, Dr. Ivo Karlovic will play Williams as a Lucky Loser. The sky is clear, and the conditions seem to mirror what we had over the weekend: nice and cool in the shade, brutal in the sun. This is a nice break for Dr. Ivo, who lost in the final round of qualifying to Gerald Melzer. I’m also glad I get to catch Rhyne Williams, since I missed his first round match against Guido Pella. 12:34 pm: In an unfortunate turn of events, it seems like the bad weather yesterday knocked out the electronic scoreboard here in the Stadium. We’re at 1-all in the first set. 12:47 pm: Dr. Ivo double faulted away a break, and both men have since held once. Rhyne Williams is up 3-2. 1:10 pm: I’m out on court 3 for Verdasco vs. Ramírez-Hidalgo. I arrived just in time to see the latter serve out the first set. And as I type the above update, Verdasco gets broken in his first service game of the second set. None of this is surprising to me: had Verdasco played a more experienced opponent in the first round, he wouldn’t be here anymore. Fernando is absolutely lost at sea. Partially related: he’s wearing his “bra” again. 1:25 pm: The crowd is trying to will Verdasco back into the march. He’s quite popular here. He just held, but RRH is still up a break, 3-2. Out on Court 7, Lorenzi is up a set on Cipolla. They’re on serve in the second. In other news, it’s actually kind of cold in the shade. I had to pull out my light coat for the first time in the entire tournament. 1:43 pm: Verdasco had a chance to get back on serve, but his backhand let him down. RRH is still up a break. I just noticed that the tournament officials took the bleachers from Court 7, and moved them into what was known as Court 4, which is adjacent to Court 3. This is really smart, because that gives Court 3 additional seating. Which is handy, given that plenty of big names are set to play here. I took a quick bathroom break, and made it back to Court 3 just in time to see RRH clinch his straightforward win over the slumping Verdasco, 6-3, 6-2. A seagull flying over Bolivia wouldn’t be as lost as Fernando Verdasco is right now. 2:15 pm: I’m back to Stadium Court to catch the third set of Karlovic vs Rhyne Williams. I also really need to warm up – it’s pretty freaking cold if you’re not in the sun. My fingers are freezing. 2:30 pm: Williams saves a break point with a very pretty forehand pass. He holds, and on we march to what feels like an inevitable third set breaker. Dr. Ivo misses a smash badly – the sun absolutely blinds him. He still ends up holding, and we’re tied at 3-all in the final set. 2:38 pm: Dr. Ivo botches a couple of easy volleys, but also makes two very pretty ones to tie this at four games apiece. 2:45 pm: It seems like Dr. Ivo is going to break the record for most aces in a match at the tournament. It will require official confirmation once the match ends, given the technological issues plaguing the tournament today. But according to the official Twitter account of the event, Dr. Ivo has over 25 aces so far. The old record, which Karlovic co-owned with John Isner, was 24. 2:53 pm: Karlovic has a break point, comes to net after a decent approach, but Williams hits a fantastic passing shot that Ivo can’t handle. Moments later, Rhyne holds for a 6-5 lead. 2:58 pm: And, to the surprise of nobody in particular, we’re into a third set breaker. Rhyne will serve first, and he already went up 1-0. Rhyne goes up a mini-break after a great backhand winner, but Dr. Ivo gets it back after a very deep forehand. 3-2, Williams. Now Rhyne gets another gorgeous FH pass to recover the mini-break edge. He is up 4-2. The next three points go according to serve. The last one involves yet another unsuccessful Karlovic foray at net. It has to be said that Rhyne Williams hasn’t missed a single crunch-time passing shot. Never a bad thing when you’re playing Ivo Karlovic. 3:07 pm: Fittingly, the match ends with another good passing shot that Ivo Karlovic can’t handle. Rhyme Williams, the winner of the Dallas Challenger, moves on to the quarterfinals. 3:12 pm: According to Media Director Pete Holtermann, it seems that Dr. Ivo served 28 aces today, which would be a tournament record. Confirmation pending, but if so, Rhyne Williams’ win becomes even more noteworthy. 3:23 pm: After a short walk to Court 3, I make it just in time to see Jack Sock force a second set breaker. The first 4 points go according to serve, to no one’s surprise. Same for the fifth point, but Isner had to clip the baseline with a volley. 3-2, Isner. Sock wins both of his service points, so now he’s ahead, 4-3. As I type that, Isner nets a tough backhand and is now down a mini-break, 5-3. Then another missed backhand, and Sock will have three set points, two on his serve. 3:29 pm: Sock only needs one, as he fires an ace up the middle to force a third set. Which is highly likely to go into a tiebreak. 3:57 pm: After a quick lunch, I’m back on Stadium Court for the big Almagro-Monfils match. Nicolás is warming up with a hoodie. It’s funny to think that I saw these two guys play a practice set on this same court last Saturday. That seems like ages ago. Gaël wins the toss, and elects to receive. 4:04 pm: Almagro dumps a forehand into the net, and faces a break point. However, he serves an ace to save it and moments later, he holds. It’s 1-0 in his favor. 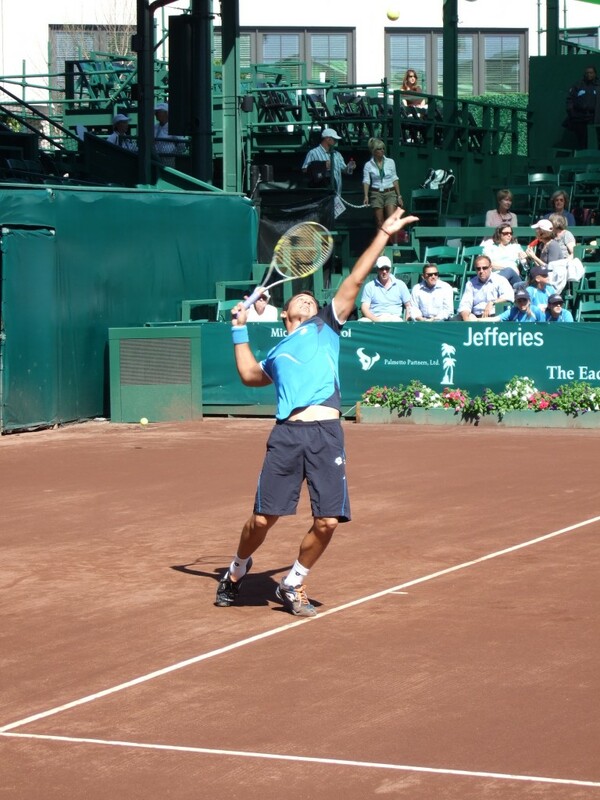 4:12 pm: Nobody is hitting the ball quite as well as Nicolás Almagro at this event. Once he starts accelerating, he’s on a different level, pure and simple. Monfils is having to run quite a bit, and he already complained to Damian Steiner, who is the chair today, about the ball kids not moving away when he’s coming close to the back fence. 4:16 pm: For the first time today, the electronic scoreboard lights up. The crowd cheers, and Monfils double faults. Moments later he faces a break point, but saves it with a thundering forehand. He ends up holding for 2-all. 4:25 pm: Almagro plays a very poor service game and gets broken after a tame backhand unforced error into the net. Rather against the run of play. 4:29 pm: Nicolás Almagro has gone off the rails. He gets broken at 15 after a string of unforced errors. His backhand started decomposing, and the forehand followed suit. A mess. It doesn’t help that Monfils is serving well and moving beautifully. Gaël has barely made a mistake so far. Moments later, Monfils serves out the set at 30. The two points lost by LaMonf were due to a pair of DFs when up 40-0. The Frenchman takes the first set, 6-2. 4:38 pm: Almagro starts the second set by falling behind 0-40 on his serve. He saves the first two break points with some thundering serves. On the last break point, Monfils had a couple of looks to be aggressive, but decided to wait for the Almagro backhand error. It never came. Potentially crucial moment. 4:44 pm: Monfils falls behind 0-40 after a mixture of errors and great ball striking from Almagro. Unlike Nicolas, he can’t serve his way out of trouble. Gaël hits a pretty awful dropper, and gets broken at love. 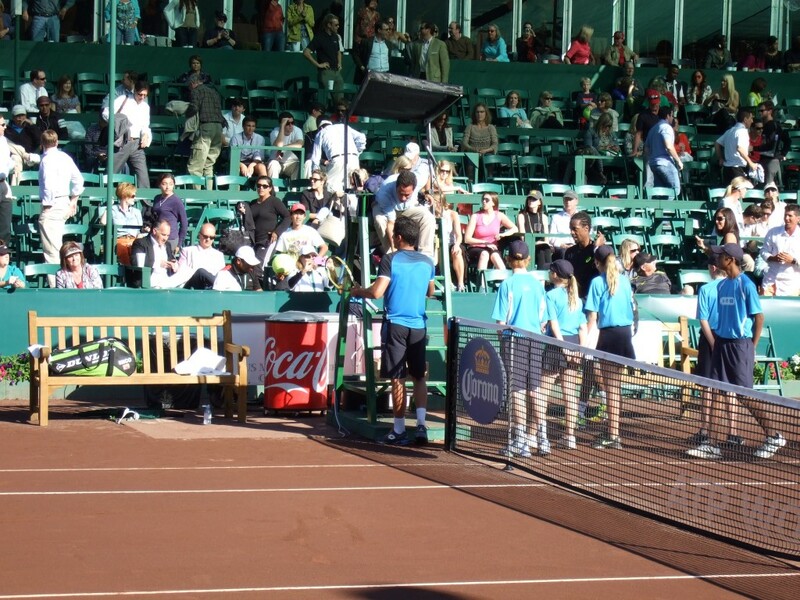 In the middle of the next game, which Almagro wins to go up 3-0, the Spaniard complains at length to Steiner about something regarding the ball kids. The crowd, which fortunately doesn’t understand much of what is being said, groans anyway. 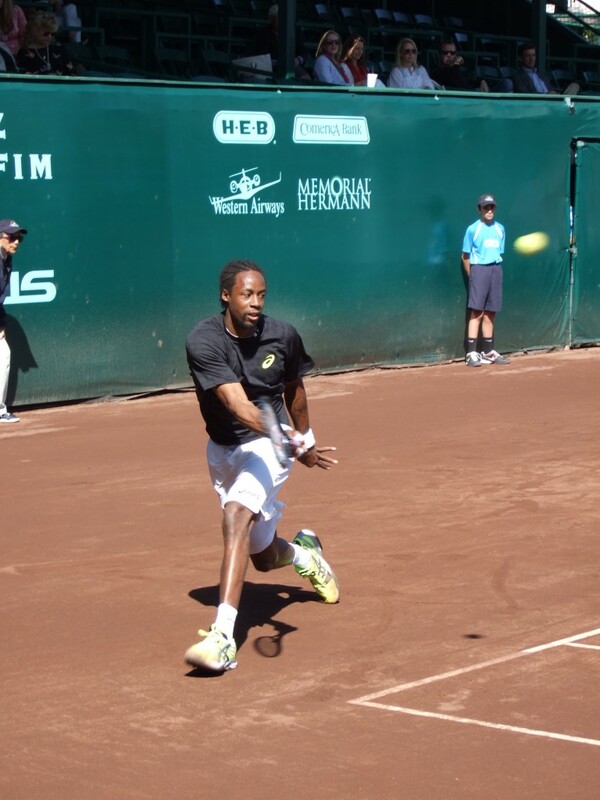 4:49 pm: The wheels have come off the Gaël Monfils train. The Frenchman gets broken again, this time to 15. It doesn’t help Monfils that Almagro is no longer a mess, and is back to striking the ball beautifully. 4:56 pm: Almagro faces a break point, but an ace spares him. He holds, and has a commanding 5-0 lead. 5:02 pm: Monfils gets broken at love to hand over the set. The last serve was pretty soft — as if Gaël had already decided to move onto the third set before he set up to hit it. Both men hold their opening service games of the third set, and in doing so, Monfils ends his run of seven straight games lost. It’s 1-all. 5:13 pm: Naturally, we get five straight holds after a bagel set. Almagro is up, 3-2. Monfils, just like at the end of the first set of his first round match with James Blake, seems to be struggling with his fitness. For some strange reason, he’s played this entire match under the sun wearing a black shirt. And shadows are only recently starting to creep into the main court. Regardless, Monfils holds, and Almagro goes on a long monologue berating himself. Now 3-all. 5:22 pm: We’re still on serve. This is starting to look like the kind of tight match that Almagro has been losing all year. Yet he has three chances to break Monfils’ serve at 4-3. Which he does after he tracks down a good Monfils dropper and puts away the resulting smash. Almagro will attempt to serve out the match. 5:30 pm: Almagro serves out the match confidently. 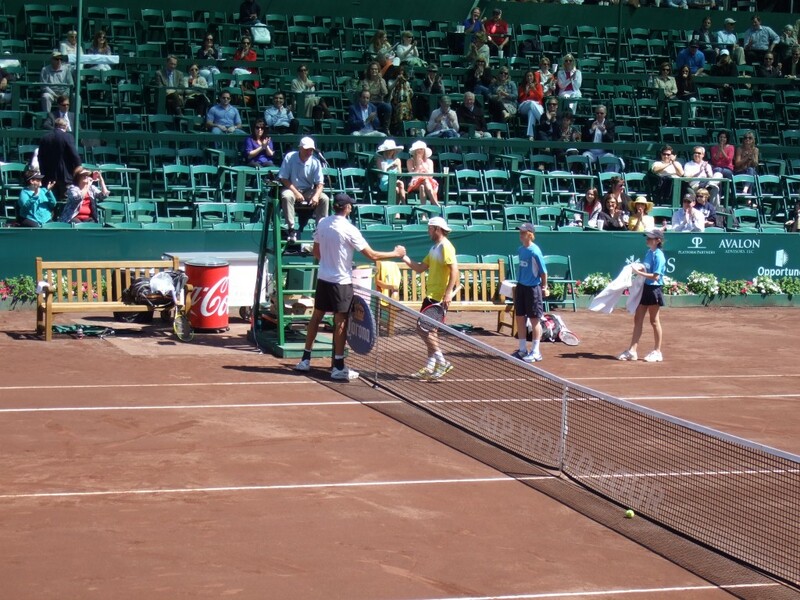 The handshake with Steiner was quite long – whatever issue Nicolás had with something on the court remains unresolved, it seems. Notice that in the picture above, Monfils has already packed up and is walking away from his chair as Almagro and Steiner continue to argue. 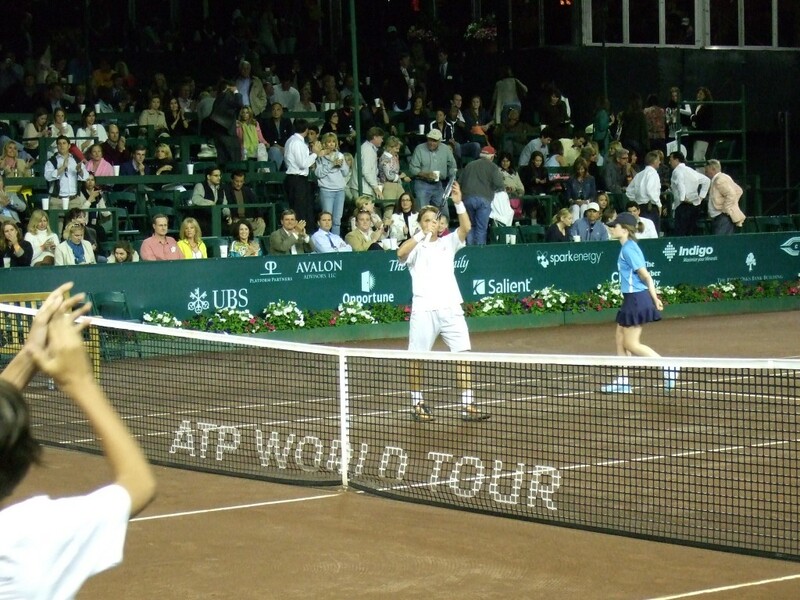 And in the picture above, Almagro keeps complaining to Steiner after saluting the crowd. Monfils has already left. I’m now in the press room, and I’ve been told that Monfils will be here shortly. – He was asked right away about the obvious turning point in the match, that first Almagro service game in the second set in which Monfils had a 0-40 lead. Gaël remembered correctly that there wasn’t much else he could have done during the first two break points – they were saved with two good serves. But that third one was the pivotal moment of the match: Monfils mentioned that he had a look at a forehand, and that he didn’t do anything with it. And he’s absolutely right: I have that moment firmly engraved in my mind: Gaël had all the time in the world to plant his feet and fire away with his favorite shot, and decided instead to meekly push it back to Almagro’s backhand. – Monfils found it difficult to shake off the disappointment of the missed opportunity, and couldn’t find a way back into the match afterwards. – Gaël also seemed resigned to the fact that he’ll be facing tough draws this year, given his poor ranking. He’s headed to Monte Carlo (where he’ll receive a wild card) and will play a full clay season. – He felt nervous at the beginning of the match, mainly due to the pressure of having to play such a tough debut match. He also seemed annoyed at having to wait so long to get a chance to play, given that he was on site practicing at least since Friday of last week, and that the awful weather yesterday delayed his opener even further. – Here’s the explanation for his long argument with Steiner. It was about the 25 second time violation rule. He says that due to the conditions, all he wanted was for the newest balls to be given to him (I assume because they wouldn’t be as heavy as the ones with more clay on them), and that the ball kids kept giving him older balls. Steiner told him that it didn’t matter and that the rule wasn’t going to be adapted for this circumstance. – Almagro gave the best answer yet about the difference between the clay here and in Europe. At first, he couldn’t find a way to explain himself in English, so I offered to translate. He said that more traditional clay is more compact (the surface and the base are one and the same), whereas here the base is very hard, and the surface is softer, looser. Which makes it slippery. Which explains exactly what I felt when I walked out on Center Court last Friday. 7:08 pm: As I walk into Court 3, I find Martín Alund in a similar predicament like then one he was in against Hewitt the other day. The man from Mendoza is down a set and a break to Ginepri. However, Alund breaks the American moments after I sit down. The Argie consolidates the break and even has a chance to break again, but misses a forehand. They’re on serve, 3-all in the second. 7:25 pm: Alund has a chance to break at 4-3, but he overshoots a second serve return. They’re now at 5-4, still on serve in the second. 7:35 pm: After a lengthy battle, Alund has a set point on Ginepri’s serve, and takes it in a most emphatic way: the Argentine bosses the baseline and unloads on some huge forehands. Unfortunately for Alund, he gets broken at love to start the final set. 7:46 pm: Alund has a chance to get the break back, but he once again can’t put a second serve kicker back in play. 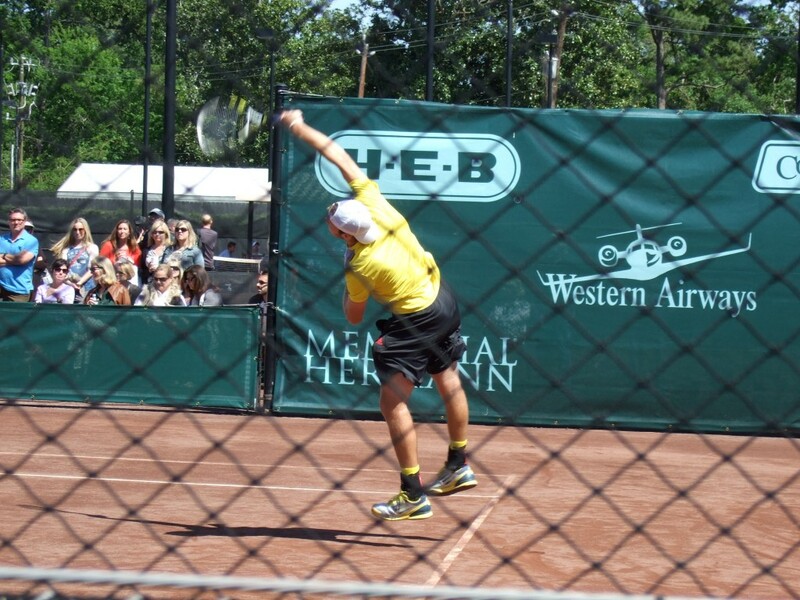 Ginepri holds, and the American then has two chances to go up a double break. After a tough game, Alund finds a way to hold, but he’s still down a break. I wonder if that last game will haunt Ginepri. A double break here would’ve surely been too big of a deficit for Alund to overcome. 8:10 A comeback by the 27-year-old Argie seems unlikely, so I’m back on Stadium Court to see if Ricardas Berankis can pull off the monster upset of second-seeded Tommy Haas. 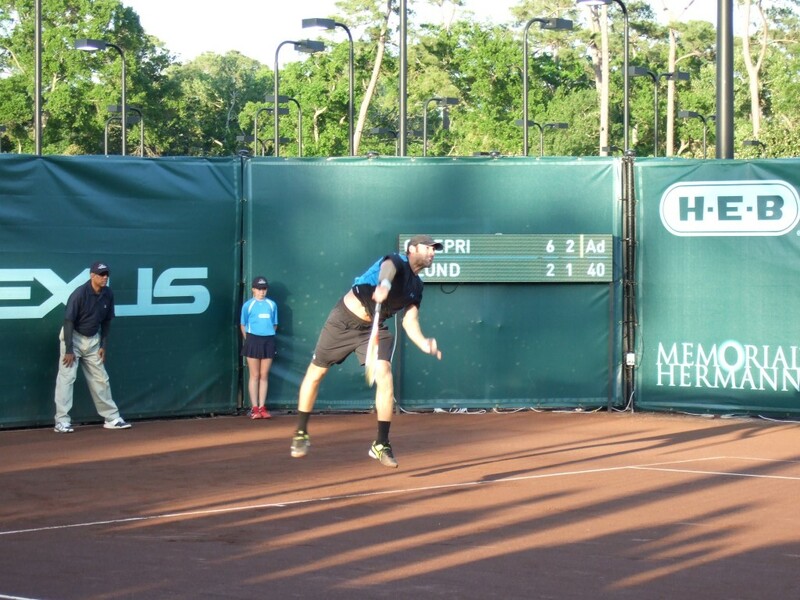 I could hear from Court 3 that the young Lithuanian went up 4-2, and he had already won the first. Just as I arrive, Haas gets a code violation for blasting a ball into the air. The reason, I imagine is that Haas is down a set and a break to the young Lithuanian, who is up 15-0 at 6-3, 5-3. 8:18 pm: And Berankis does it! With a beautiful backhand down-the-line winner on match point. Fantastic shot, particularly after botching three match points moments before. The kid had been up 40-0 in that last game. 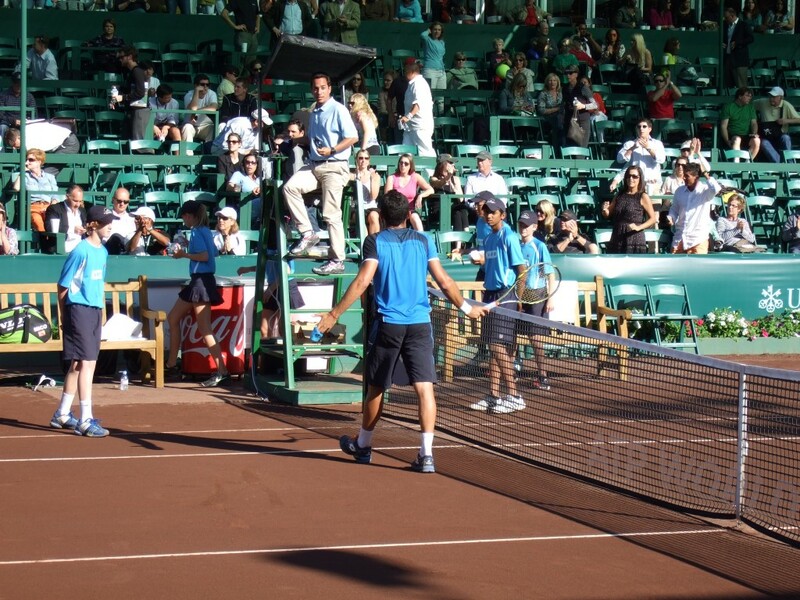 – Haas just never found a way to get into the match. Didn’t take advantage of any positive momentum during it. An example he gave was the last game: he saved three match points and then missed a simple backhand return by a few feet. 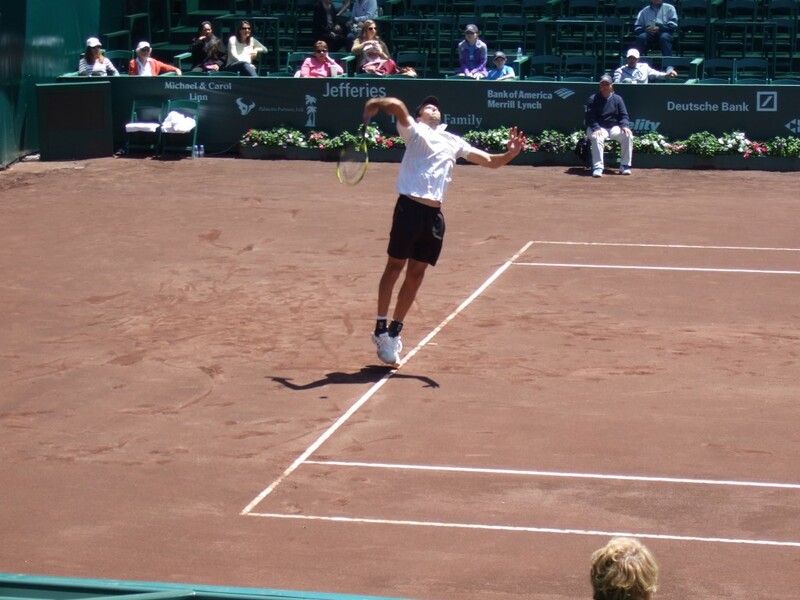 – Haas was also quick to note that Berankis played very well in the big moments, and that the youngster was aggressive throughout the match, singling out the fact that Ricardas was quite willing to go down-the-line a lot. 8:58 pm: Speaking of the 22-year-old, Ricardas Berankis was just here, and since my brain is fried, I’ll leave you with some general impressions of him, with some highlights mixed in. – Berankis is just a really polite young guy. He’s been the only guy that I’ve seen walk into the media room and greet the press. Seemed quietly delighted at his win, which should come as no surprise. He said his main goal was to stay healthy and get stronger, since he had so many physical issues last year. 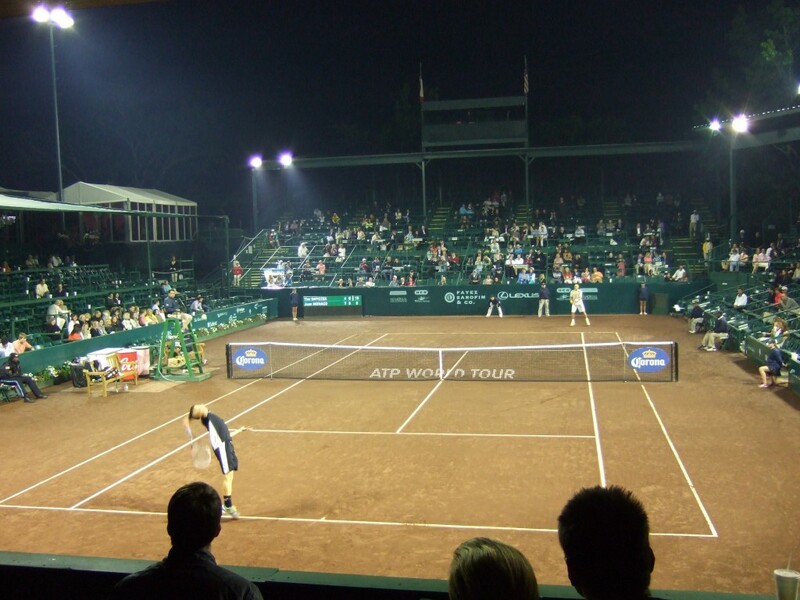 10:22 pm: I saw Juan Mónaco, the event’s defending champion, win his match against Tim Smyczek, 7-6 (5), 6-1. I saw most of the first set tiebreaker and parts of the second set. He was playing well, hitting the ball with purpose. Mónaco will be coming to the press room in a few minutes and I’ll update this with highlights from his presser when I get home. – Mónaco said that the first set was tight (apparently there were no break points for either guy, which is kind of remarkable since neither has a particularly great serve), and that he was lucky to play well in the breaker. – He also mentioned that he got more used to the conditions in the second set. It was a little misty over on Stadium Court, and Mónaco said that the humidity made the ball get dirtier than usual, which made it hard to see the ball properly. – I asked Juan if the recent success of the Argentine Davis Cup team had given him a lift of sorts. He said that it’s always nice to win a tie, particularly one that is as difficult as the recent bout with France. One thing I found interesting is that he said that it’s always helpful to get that week of practice ahead of the tie. He feels like the work he put in prior to the live rubbers help him feel a little bit better during a week like this, where he’s out here in Houston playing a 250. 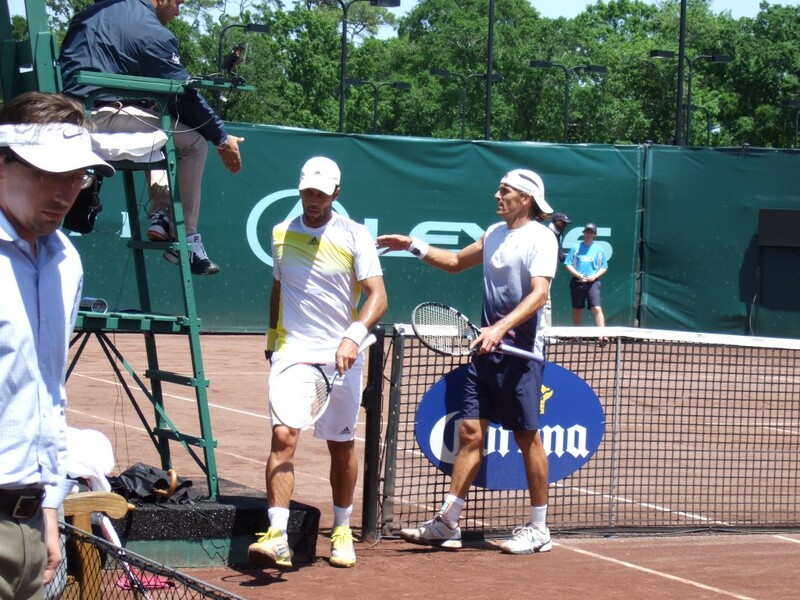 – Mónaco said that the clay here is like “sand.” See why I like Almagro’s quote so much better? – I asked Juan about his hand, and he said it was okay. It’s getting better. He showed up to the presser with ice over both of his wrists. – Mónaco wasn’t all that concerned about not getting his first ATP tour win until today, because of the three wins (and only one defeat) in Davis Cup. – Juan said that it’s tough to have to play a regular tour event after such an emotional Davis Cup week, but that he’s happy about how he’s handling this at the moment. 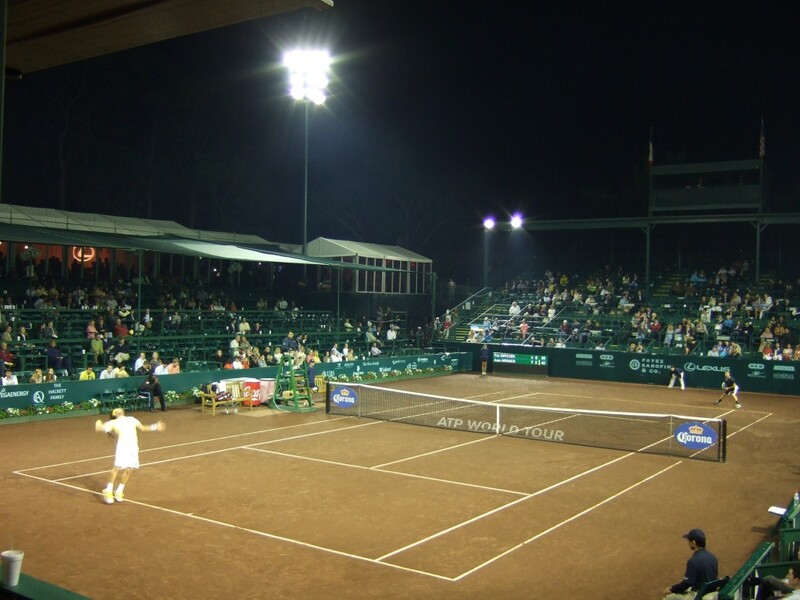 – He’s quite aware that his next match against Robby Ginepri will be tough: Ginepri has won five straight matches in this tournament, given the three wins in the qualies. There you have it. At around 10:40 I packed up and headed home. I’m sorry about all the typos and graphic poverty of the Liveblog during the day, but I hope it’s more readable now. By the way, the ATP scoreboard is not working at the moment for Houston so any kind of info would be good. The comparison of Fer to a seagull cracked me up. And I’m delighted by the additional access to the players (which, in my mind, is what it amounts to) you’re getting because they can chat with you without the English barrier. This blog has been on point. Nice updates with the pictures being a nice plus since Houston’s stream has been iffy.